Collaboration is great, especially if you're not the other person, because clearly they'll be doing all of the work. Using that logic to build up their kicks brand, Shoe the Bear. Launched by a Danish concern using the motto "a sneaker is never just a sneaker", STB commissions a different artist to design each new batch of arty footwear they release -- the latest dupes're another Danish design duo named SHFT, who some have heard are bad mother..lukker munden påg! (But we're talking 'bout SHFT here). 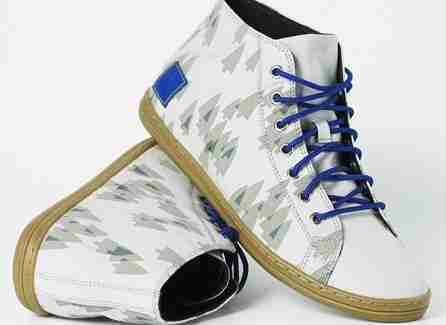 Notable steez starts with mid-cut hi-tops, including a striking blue canvas Chuck Taylor-style job w/ a teal sole & accent up the heel, and, sporting bright blue laces, a white leather pair scattered with ashen pine trees, suggesting they've traveled down The Road. Subtler territory's the domain of an indigo mid-top with white stitching deets/soles & brown leather laces, a full-grain leather Wallabee-esque job in your choice of black or brown, and a monochromatic (gold, black, or grey) set rocking full-grain leather trim/laces, and dimpled suede upper, aka, cowcaine. 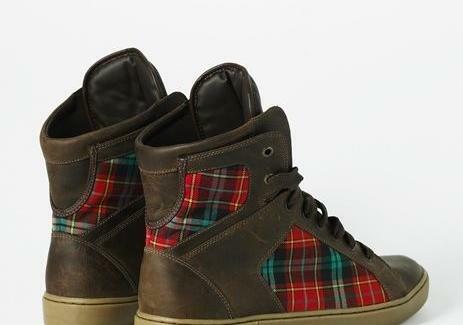 If ultra high hi-tops're your thing, there're shin-cradlers like a brown leather & tartan canvas job called the Lumberjack, a profession where failing to pull your weight will definitely get you axed.